With hopes to revive the sales of its flagship motorcycle, the Dominar 400, Bajaj Auto has introduced the updated variant for 2019. We got an opportunity to swing a leg over the new model for a quick first ride review. For 2019, the motorcycle packs more power, improved refinement and premium hardware. However, is it enough for the brand to aim for the optimistic sales target that it had set at the launch of the first-generation model nearly two years ago? We find out. 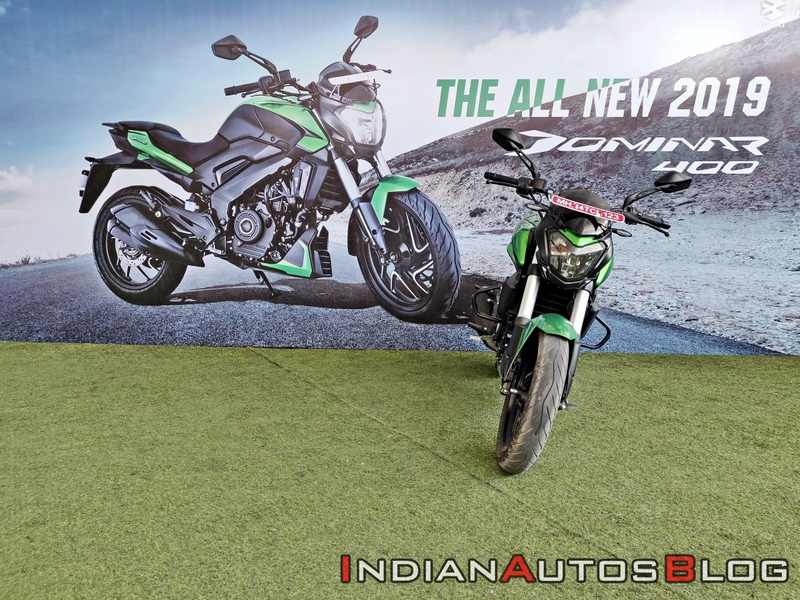 The 2019 Bajaj Dominar carries forward the styling of its predecessor although it packs several new features such as upside-down forks, a revised instrument console and a new colour option. 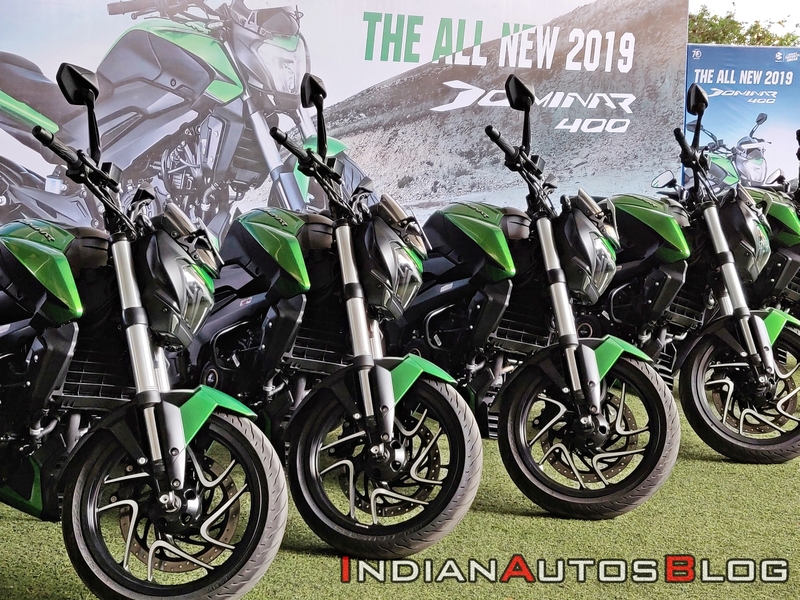 The 2019 Bajaj Dominar 400 retains the silhouette of its predecessor, and each body panel continues to feature an identical shape and structure as the discontinued version. Thus, you would spot a LED headlight at the front, a muscular 13-litre fuel tank, a split seat setup and twin LED strips for the tail light. However, close inspection reveals just how much the motorcycle has been updated. The front, for example, gets a pair of 43 mm upside-down telescopic forks that replace the conventional units from its predecessor. The new setup gives the 2019 Dominar 400 an even more beefy look to the front and adds a big bike persona to the motorcycle. The updates continue as the vision ventures forward, and the cockpit now features a revised instrument console. The information is divided into two screens to keep the display uncluttered and exhibit ride related data efficiently. All the data, similar to the discontinued model, is displayed on the full-digital screen. The primary display features a tachometer, speedometer, fuel gauge and a DOT matrix display that offers various warning signs such as service reminder, engine kill ON warning and side stand indicator. The ride related information available includes current fuel consumption, average fuel consumption, average speed, trip time and fuel range. Amber display icons that sit below the primary display include ABS, high beam, neutral gear, malfunction light, turn indicator, alarm, and RPM limit. The information can be toggled using the “Mode” and “Select” buttons that are mounted on the secondary screen. The secondary screen, which is mounted on the fuel tank, displays the gear position indicator, odometer and clock. 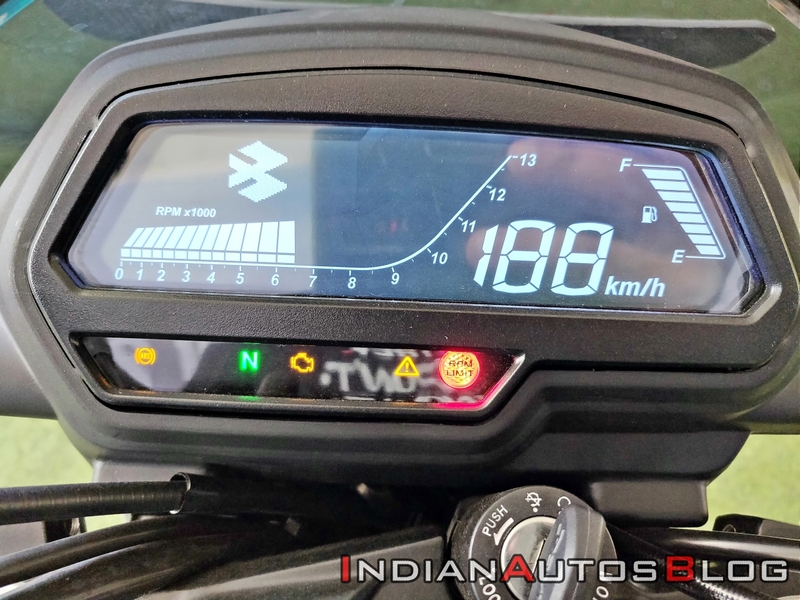 While the setup effectively offers a cleaner look to the information presented, Bajaj should have kept the gear position indicator on the primary display. The fuel gauge, on the other hand, would have been a perfect fit on the tank-mounted screen. The revised, split display is aimed to show ride related information efficiently without cluttering a lot of details in the same space. Other revisions to the cockpit include wider bar-end weights to reduce the vibrations. The rear view mirrors get cast aluminium stalks that add a premium look to the 2019 Dominar 400. As mentioned above, all body panels remain identical to the previous generation model, and thus a 13-litre fuel tank follows the cockpit. The split type seat retains the shape and padding but now comes with D (for Dominar, in case you’re wondering) hot-stamped on the pillion part of the saddle. The 2019 model gets bungee straps that are neatly hidden under the pillion seat, and are aimed to tie luggage to the motorcycle more efficiently. The LED tail light retains its original design although the internals have been revised to add a rejuvenated look. LED blinkers complete the lighting setup at the rear. The sides reveal a new twin-pod exhaust that replaces the single-outlet unit on the discontinued model. The new exhaust adds a bass-filled and throaty sound to the motorcycle. Other changes include a repositioned disc brake at the front that now features radial callipers. Bajaj Auto does not plan to develop accessories for the Dominar 400. However, it has passed that baton to Pune based Autologue Designs who would create accessories and deliver them to Bajaj dealerships as per the demand. Bajaj would approve the list of accessories, but the optional extras would not bear any branding or part number from the two-wheeler manufacturer. The list would include a taller windscreen, saddle stays, pillion backrest and a bash plate – all of which are targeted to enhance the motorcycle’s touring capabilities. While the 2019 Bajaj Dominar 400 carries the same design as its predecessor, the updated hardware adds an even more appealing look to its latest iteration. The addition of upside-down forks gives the motorcycle a muscular and beefy look that the Dominar always deserved. The updated instrument console does its job neatly and displays the readings efficiently even in bright daylight. However, one cannot overlook the fact that the gear position indicator is placed at a rather inconvenient location and it cannot be seen when crouching over the tank. Apart from styling, the colour palette has also received a revision, and the 2019 iteration of the motorcycle can be purchased in two colour options – Auroral Green and black. However, Bajaj could add choices to the list of colours as per the demand. All the revisions have resulted in a net weight gain of two kilograms. Does it mean the 2019 model is slower? The 2019 Bajaj Dominar continues to use a BS-IV compliant 373.2 cc, single-cylinder, liquid-cooled engine although it now features a dual overhead camshaft. The motor is tuned to deliver 5 PS more power than its predecessor although the ARAI certified fuel economy remains unchanged at 27 kmpl. Apart from visual upgrades, Bajaj has also revised the engine on the 2019 Dominar 400. The motorcycle continues to feature a 373.2 cc, single-cylinder, liquid-cooled motor with three spark plugs although it trades single overhead camshaft for a dual overhead unit. That, along with a remapped ECU has resulted in a performance bump of 5 PS. Thus, the 2019 Dominar 400 makes 40 PS of maximum power at 8,650 rpm as against 35 PS at 8,000 revs on its predecessor. The peak torque remains at 35 Nm, but it now comes at 7,000 rpm as against 6,500 on the discontinued model. The compression ratio has also gone up from 11.3:1 to 12.1:1. Thus, despite the increase in weight, the power-to-weight ratio has gone up from 192 PS/ton on the discontinued model to 217 PS/ton on the 2019 version. The 2019 Dominar 400 is quicker than the model it replaces. The 0-60 kph sprint takes 2.7 seconds while 0-100 kph can be achieved in 7.1 seconds. In comparison, the discontinued model did 0-60 kph and 0-100 kph in 3.11 and 8.23 seconds respectively. The top speed has gone up too, and the 2019 variant can reach up to 156 kph (versus 148 kph). The added bump in performance has not affected the fuel economy, and the updated Dominar 400 gets the same ARAI certified number of 27 kmpl. In terms of character, the motor feels comfortable anywhere above the 4,000 revs while there is a noticeable increase in acceleration post 6,000 rpm. The 6,000-6,500 revs zone is the sweet spot to cruise, and the motorcycle holds 110 kph on the speedometer in the sixth gear around those rpm levels. There’s sufficient power in reserve for quick and clean overtakes from this point. The engine is mated to a six-speed gearbox that retains the slipper clutch feature. The gearshifts feel crisp and precise, and we had no complaints during our short stint with the motorcycle. Braking department has received an upgrade too, and while the disc size, at 320 mm and 230 mm, remains unchanged, the front now features a radially mounted calliper. The feedback from the setup is at par, but it’s nothing to write home about. The safety net of dual-channel ABS comes as standard. 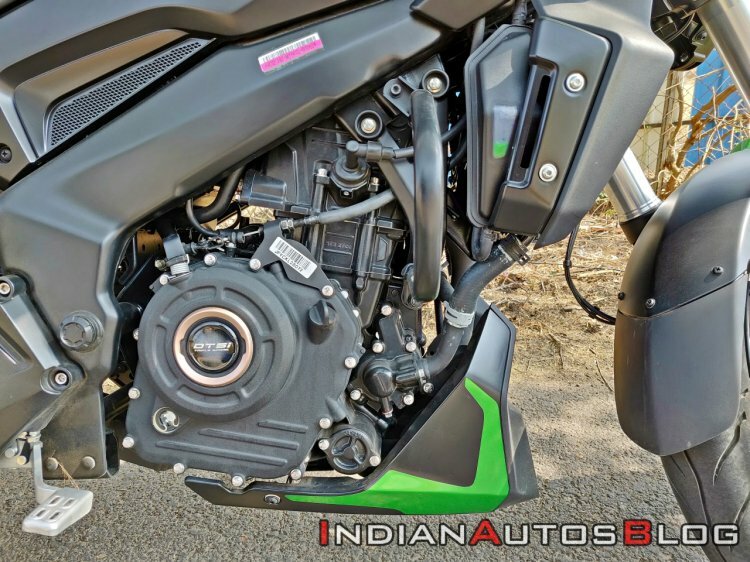 The added power is a welcome change while the Indian buyers would appreciate the fuel economy, which is identical to its predecessor despite the bump in performance. How does it behave in terms of ride quality and handling? The inclusion of the upside-down forks aids the ride and handling department. Bajaj has softened the rear suspension on the 2019 model to improve the ride quality. The ride and handling department witnesses a step up with the addition of 43 mm upside down forks that replace the conventional units from the previous Dominar 400. The rear continues to feature a monoshock although Bajaj has revised its tuning for better comfort. Therefore, while the ride quality has improved, the setup isn’t too soft to affect the handling prowess of the Dominar 400. Bajaj has managed to tune the suspension to match the sporty while offering comfort by filtering out any minor creases on the tarmac. The MRF sourced REVZ tyres offer a decent amount of grip, and they could be fun on a weekend ride. However, if you do intend to go serious canyon carving, we would recommend looking at something with Metzeler branding. That said, the MRF sourced rubbers do offer plenty of grip to tackle any challenge that the city roads could throw at them. The rider’s triangle on the 2019 Dominar 400 has been retained from its predecessor, and the motorcycle continues to offer a perfect mix between sporty stance and comfortable ergonomics. The comfort levels are better than the outgoing model thanks to the relatively softer suspension setup although you would feel the change in the tuning of the shock absorber at high speeds. Bajaj has also addressed the vibration issues. Unlike the previous model, the 2019 Dominar feels more refined in the mid-range. There are still some noticeable vibrations from the footpegs as you get past the 8,000 revs mark and move closer to the red line. The 2019 Bajaj Dominar 400 is a proper step-up over its predecessor. The increased power output and the premium hardware make it a desirable package although we are yet to hear the final prices. Bajaj would make the price announcement in a couple of weeks (from March 6, 2019). 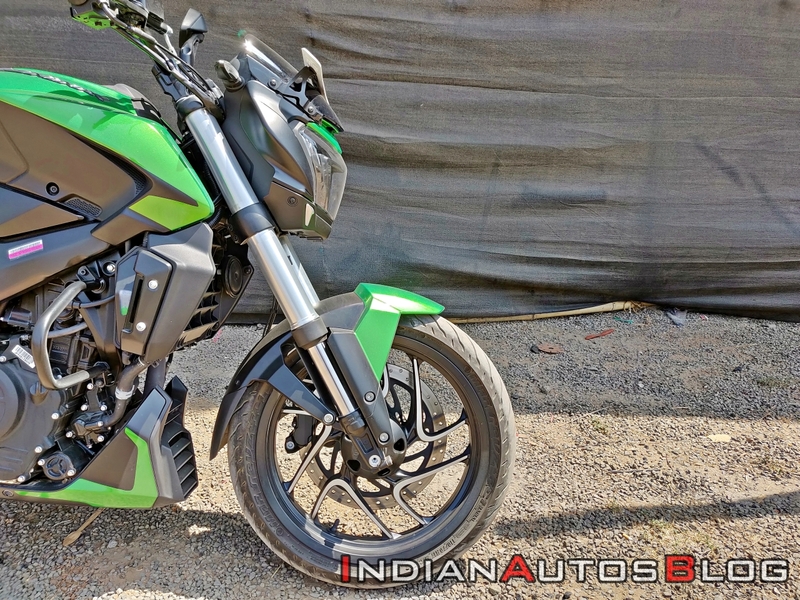 The 2019 model is what the Bajaj Dominar 400 should have been right from the beginning although it isn’t too late to the party. The new hardware setup adds a big-bike feel to the Dominar 400 and makes the package more premium than before. Add the improved refinement levels, and you have a package that should give its rivals sleepless nights. Yes, we still wish Bajaj revises the instrument console and bring the gear position indicator back to the primary screen, but if you can live with it, we cannot think of another reason why you should not write a cheque right away. It offers a proper alternative for folks who are looking at value for money package while also desiring good performance numbers. Speaking of prices, the final ex-showroom tag is still under wraps, but we expect the new model to arrive around the INR 1.80 lakh point.